Does Clearing the Hepatitis C put Cryo In Remission? You are here: Home / Blog / Does Clearing the Hepatitis C put Cryo In Remission? Will my CRYO go away if my Hep-C is cured? I’m seeing a lot of people who have Hep-C that has been eradicated. But they still have cryo after many months or years, yet the doctors do not aggressively treat their cryo. I’ve noticed a couple of cancer patients, also in remission, who have cryo that is NOT in remission. Why are these people allowed to suffer like this when cryo is typically treatable? It seems to me that there is an erroneous perception that the cryo should remit if the underlying cause is removed. The plain and simple fact is that this is not always true, and is likely almost never true. The medical community is missing the mark on this one, by failing to treat the patient. Doctors need to wake up and pay attention to what their patients are experiencing. (1) the innate immune system… it is a “hard-wired”, “pre-programmed” engine that detects and destroys agents that are not “self”. (2) the acquired immune system… This is the “learned” immune system. The immune system identifies things that are not “self” and will attempt to remember a copy of at least part of a protein sequence so that the immune system can immediately respond to the unwanted agent. For example, you might catch a virus once, but after that, the immune system will remember it for a long time and you are immune to that virus for a long time. Eventually, the acquired immune system forgets and you catch the virus the next time you encounter it. This “memory” can last for years. 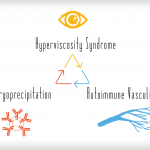 Cryoglobulinemia leverages the acquired immune system. 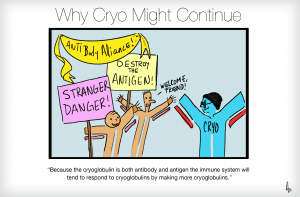 Because the cryoglobulin is both antibody and antigen the immune system will tend to respond to cryoglobulins by making more cryoglobulins. If you manage to suppress the immune system deeply long enough for the cryoglobulins to be eliminated you have a full remission that will abruptly end when something stimulates the immune system. 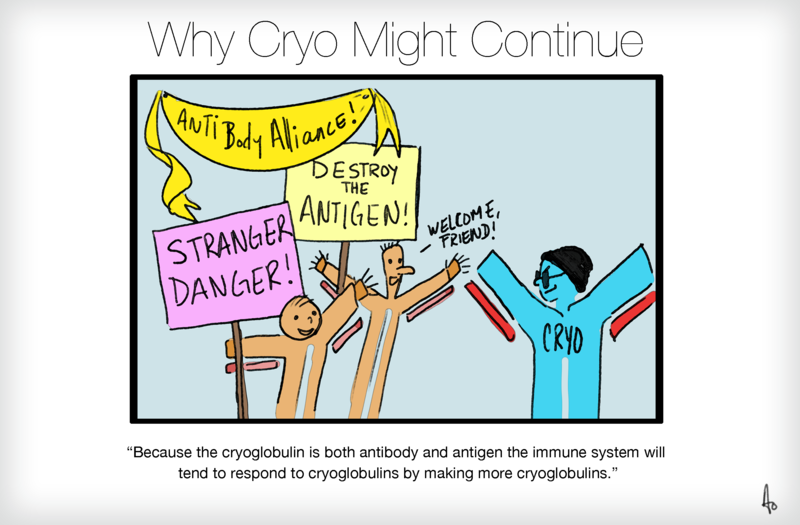 This happens because the immune system remembers to make cryoglobulins in response to cryoglobulins. A few people with cryo also have a connection involving the innate immune system. If you have ANTI-PR3 antibodies this is a connection to the innate immune system Some people with Lupus also have this. The function of this is unknown to me as of this writing. I have high levels of ANTI-PR3 antibodies. In my opinion, the only way to have a hope of breaking this cycle at present is to establish a full remission and to keep the cryo in remission long enough for the immune system to “forget” about making/attacking cryoglobulins, and even this only works in a few cases. This entire scenario might not even apply to type I CRYO, so there is every hope it will remit if the cause is found and corrected. 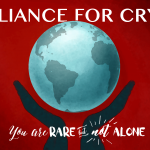 In my opinion, if you have cryo secondary to Hep-C or cancer, and the cause has been eradicated, there is every hope that the cryo can be treated and can also be eliminated as well.